UK: Vattenfall has announced the UK arm of steel fabricator Eiffage will manufacture the 11 suction bucket foundations for its 92.4MW European Offshore Wind Development Centre project off Scotland. 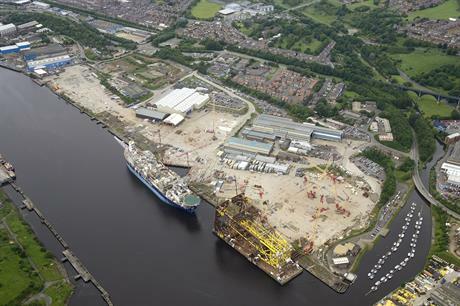 Smulders will manufacture the foundations at the Wallsend yard in Newcastle, northeast UK, which was acquired by the fabricator at the end of 2016 from the OGN Group, Vattenfall said. "The total number of around 140 jobs involved in the work could more than double to around 400 posts as a result of the contract," the Swedish developer said. Vattenfall's Balance Of Plant contractor for the project, Boskalis, awarded the contracted to Smulders. Smulders has extensive knowledge of offshore wind, having been contracted to supply transition pieces for the 402MW Dudgeon and 317MW Sheringham Shoal offshore projects in the UK. "We are going to use this yard for the fabrication of the lower parts of the jacket structures and to do the final assembly of all associated parts. This has been made possible by means of the necessary investments in lifting facilities which we did on our yard," said Smulders deputy managing director David Muylaert. Smulders is part of the French group Eiffage, which also includes Dutch fabricator Iemants. Eiffage has worked on gravity-base foundations for Seatower, while Iemants was contracted to manufacture the substations at the Gemini and Merkur offshore wind projects. The EOWDC, which faced legal opposition from Donald Trump, will comprise 11 MHI Vestas V164 turbines, optimised to 8.4MW output. The project is due online in 2018. "The buckets enable faster offshore installation of the EOWDC, while keeping noise to a minimum, and allow easier decommissioning as the installation process is reversed," said EOWDC project director Adam Ezzamel. "As such, the technology will contribute to driving down the cost of clean power as offshore wind moves into deeper waters and more complex seabed conditions."